Usually it’s California that sets the trend for new laws and guidelines, especially those relating to discrimination. But New York has taken a stand, and quite a stand it’s taken. The New York City Commission on Human Rights released Guidelines (the “Guidelines”), relating to a New Yorker’s right to maintain any hairstyle it wants, unless it becomes a safety or heath issue. And, if there is such a policy, it must be neutrally applied to ALL people, not just those of a certain race, alienage, or culture. This bold move comes as a result of seven complaints of hairstyle discrimination by New York employers. One can only anticipate, with these Guidelines, there will be more complaints to come. It’s important to note that neither the New York City Council nor any New York court has endorsed the move, but a cautionary note to employers—take heed, the writing is on the wall. While the Guidelines apply to the hairstyles of all races and cultures, in particular, the focus has been on the hairstyles of Black people or people of African descent. 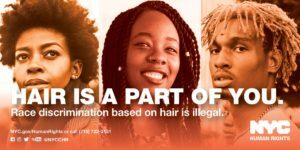 The issue has been whether an employer could forbid someone from wearing natural hair, cornrows, locs, twists, braids, or any other style indicative of a particular culture, or if the employer could require someone to relax and/or wear their hair in a style approved of by the employer. 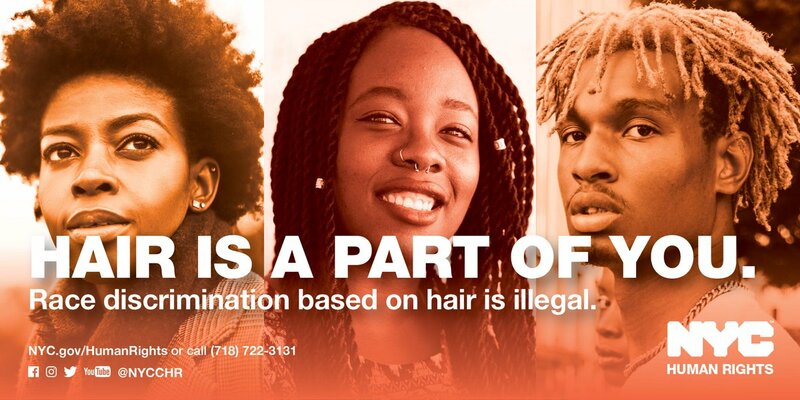 In its Twitter feed, the NYC Commission uses the hashtag #YourHairYourRightNYC and distills its message in a simple tweet, “Hair is part of you. Race discrimination based on hair is illegal in NYC.” This is now called Hairassment. The Guidelines cover the behavior of employers and public accommodations. Employers are prohibited from enacting discriminatory grooming policies. Public accommodations e.g., schools, businesses, recreational areas cannot discriminate against an individual based on a hairstyle that is associated with the individual’s race, ethnicity, or culture. Banning the use of color, dye, extensions, or pattered or shaved hairstyles for African-descent employees only. Requiring employees to change the state of their hair to conform to the company’s appearance standards, including having to straighten or relax hair (for example, by using chemicals or heat). Compelling only Black people to get approval before changing their hairstyles. her people. A private school has a policy prohibiting locs or braids. A public-school athletic association prohibits African-American student athletes with locs from participating in an athletic competition because his hair is below his shoulders but allows white student athletes with long hair to tie their hair up. A charter school informs a student that she must change her Afro because it is a “distraction” in the classroom. A children’s dance company requires girls to remove their braids, alter their Afros, and wear only “smooth buns” to participate in classes. A nightclub tells a patron she is not welcome because her natural hairstyle does not meet the dress code. I am Attorney Francine Ward providing you with useful and accurate legal information. Law Facebook Page, Twitter Law Page, LinkedIn, Instagram.